Legislation making huge reductions to Renewable Heat Incentive (RHI) scheme payments has cleared its final hurdle in Westminster. It will pave the way for further deep cuts to subsidies from £13,000 to £2,000 per boiler. Opponents have claimed it will put some businesses on the scheme under financial pressure. But a claim that calculations underpinning the cuts were "flawed" has been rejected by civil servants. The legislation means the new rates will take effect from April 1st 2019 but it will almost immediately meet a court challenge over its legality. A case has been listed in the High Court on 4 April. Claimants point to the fact that former minister Arlene Foster personally guaranteed levels of RHI subsidy for 20 years in a 2013 letter to the banks. But the subsidies have since been slashed twice to rein in a runaway budget which caused a political scandal that collapsed Stormont. The legislation making the cuts was approved by the Lords on Tuesday night and will now receive Royal Assent. The Renewable Heat Incentive was introduced in 2012 to encourage businesses in Northern Ireland to switch away from fossil fuel heating. Those opposed to the cuts say that if they are imposed, scores of firms will revert to fossil fuel heating, undermining the rationale for the entire scheme. Image caption RHI boiler owners claim calculations used to help justify big cuts in their subsidies are "fatally flawed"
The Economy Department said the changes needed to be made by 1 April or the scheme would be in breach of EU rules on government support for business and payments would have to stop. But MPs and peers were unhappy with the time afforded for parliamentary scrutiny saying it had been rushed. The Northern Ireland Affairs Committee will run a short inquiry looking at the rationale for the cuts. The Lords agreed to pass the bill without amendment after the Economy Department offered to establish a unit to look at any hardship cases caused by the new subsidy payments. It will be chaired by an independent figure. Peers said they were approving the bill because to refuse to do so would mean money to claimants would dry up. But due to the structure of payments and the fact that only a portion of heat is eligible for support, some firms may not now receive further payments until much later in the year. Earlier, the Renewable Heat Association, which represents about half the 1,000 or so businesses in the RHI scheme, called into question one of the calculations on which the reduction was based. Economy officials had told MPs that there was little chance of firms turning off their boilers because the price of wood pellets was cheaper than fossil fuel alternatives. But the Renewable Heat Association has produced its own figures which purport to show that gas is cheaper. It said that would not only mean firms would switch back to gas, but that calculations used to work out the new level of RHI subsidy were wrong. In a letter to a senior official in the Economy Department, the Renewable Heat Association urged officials to "press the pause button on this 2019 legislation as it is based on misinformed assumptions and needs further investigation". But a spokeswoman for the Economy Department rejected the claim that gas was cheaper. "The analysis and evidence underpinning the long-term tariffs is robust. Up-to-date evidence gathered through the RHI inspections process demonstrates that biomass remains the cheapest fuel source available to Northern Ireland businesses in today's market," she said. She added that were that to change, the tariff position would be reassessed. 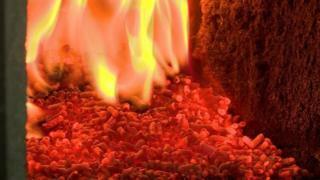 The Department for the Economy said new subsidy levels were necessary to keep the scheme legal but would ensure RHI claimants got a 12% rate of return on their investment. It claimed that many RHI claimants had received returns far in excess of that, in breach of EU rules on government support for business.